It’s the park dedicated to cinema and entertainment. Most of the thrilling rides are in Walt Disney Studios. From Disney park you can hear people screaming especially those who are riding the tower. 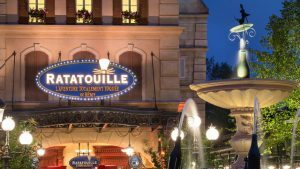 This attraction offers an inside look to Remy the rat’s restaurant, based off Ratatouille the movie this ride “shrinks” the rider and shows the restaurant from a rat’s viewpoint. Ideal for any age and size this journey requires 3D glasses and movement that those prone to motion sickness ought to be aware of. Average waiting time for this attraction ranges from an hour to an hour and a half, FASTPASS is available on this ride. 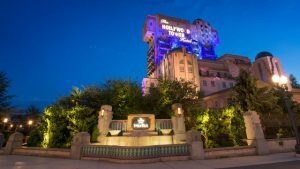 This eerie attraction allows visitors to travel into a hotel that is stuck in the twilight zone. Those who dare enter must be over 1.02m (3ft 3in), and those prone to claustrophobia or motion sickness should proceed with caution into this hotel. Average waiting time ranges from 30 minutes to an hour, FASTPASS is available on this ride. This roller coaster ride is inspired by Aero Smith. Those who enter must be over 1.2m (3ft 9in) and those who are prone to motion sickness should be warned of the turns, drops, and quickness of this ride. Average waiting time ranges from 10 to 30 minutes FASTPASS option is available on this ride. 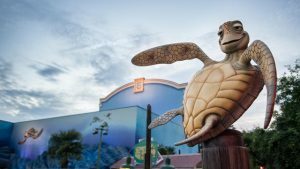 This small roller coaster ventures through Nemo’s sea. An ideal ride for all ages that are over the height of 1.07m (3 ft 5 in). Average waiting time of an hour to an hour and a half. FASTPASS is not available on this ride. 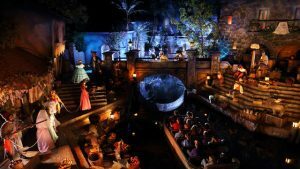 Adventure Land is a great place to explore and experience the thrilling adventures of pirates and explorers, this land is perfect for the daring and courageous. 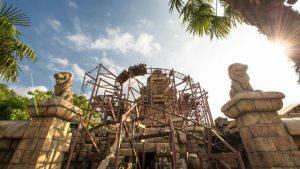 This attraction, based on Indiana Jones the Temple of Peril, offers a great thrill to all who dare embark on the journey. As the attraction is a roller coaster ride it is not ideal for those who are prone to motion sickness, only those who are 1.4m (4 feet 5 inches) or taller will be permitted. Average waiting time for this ride ranges from 10 to 50 minutes and a FASTPASS option is available. X marks the spot for this attraction, based off the Pirates of the Caribbean movies this ride is ideal for anyone searching for a glimpse into a pirate’s life. People who do not want to get wet or are afraid of the dark may want to stay away from this attraction. Average waiting time is 5 to 10 minutes and the FASTPASS option is not available on this ride. Discovery land is a fantastic place for all those wanting to explore the final frontier, children of all ages will love the land dedicated to exploring Space. 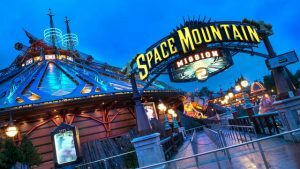 This Disneyland classic is a roller coaster ride that takes you on an adventure through space. Those prone to motion sickness or claustrophobia should be weary of this ride. Space travelers under 1.32m (4 ft 3in) will not be allowed on the ride. 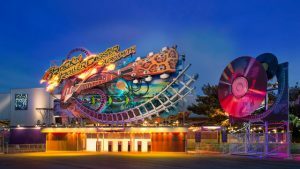 Average waiting time to space ranges from 60 minutes to an hour and a half, FASTPASS option is available. 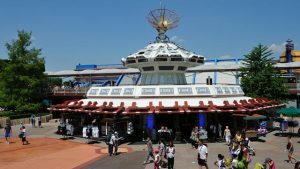 (Note: From the spring 2017, Space Mountain: Mission 2 will be replaced by Star Wars Hyperspace Mountain. The exact date has yet to be confirmed). 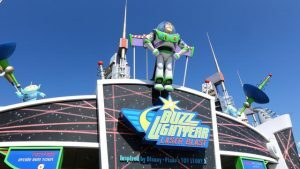 Help Buzz protect the world, in this attraction the player(s) are given the chance to fight to save the world. This attraction is suitable for all ages, however, those prone to motion sickness should heed caution as this ride spins. Average waiting time ranges from 30 minutes to an hour, FASTPASS option is available here. Journey into the world of Star Wars, this ride uses the Force to allow the rider to explore the galaxy. Those under 1.02 m (3ft 3 in) will not be allowed to enter the ride, additionally those prone to claustrophobia or motion sickness should be cautious about this ride. Average waiting time for this ride ranges from 10 to 30 minutes, FASTPASS option is available on this ride. Set off to explore the Wild West and its haunted mansion! It’s a mine train roller coaster. There is no looping and it doesn’t exceed the reasonable speed. 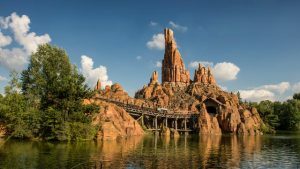 It’s one of the famous rides in this land so you should consider at least more than 45 minutes wait in the queue or you can get a FASTPASS ticket. Guests must be 40 in (102 cm) or taller. 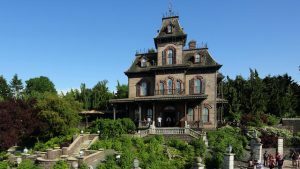 This attraction has offered a spooky time for visitors since the opening of Disneyland Paris. Although a classic, this haunted house may not be for younger children or anyone who feels claustrophobic. Average waiting time ranges from 10 to 30 minutes and the FASTPASS option is not available for this attraction.